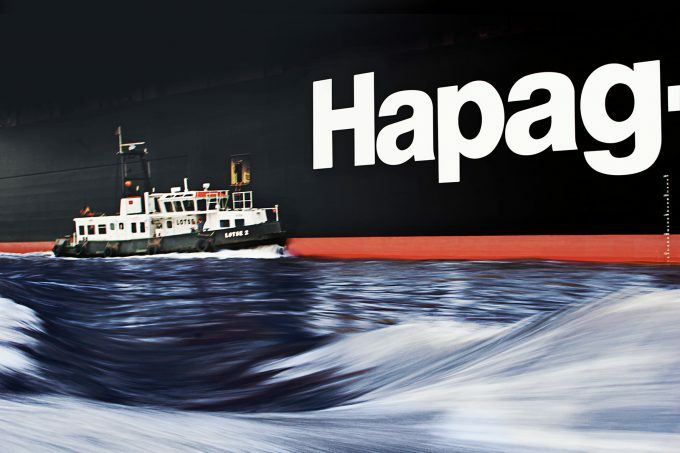 Hapag-Lloyd slid back into the red in the first quarter, hit by higher bunker prices and alliance restructure costs. The ocean carrier posted a first-quarter loss of $66m, after having moved back into the black in the final quarter of 2016 with a profit of $46m. Q1 volumes grew by 7% on the same period last year – mainly driven by strong growth on intra-Asia and transpacific trades – to 1.9m teu, which produced revenue of $2.27bn, also up 7% on the previous year. However, average revenue per teu fell by 2% to $1,047 as bunker prices leapt 69% to an average of $300 per tonne in the quarter, compared with the average $178 paid during the first quarter of 2016. At a results presentation in Hamburg this morning, Hapag-Lloyd chief executive Rolf Habben Jansen confirmed there had been some additional costs in the final weeks of the quarter associated with the carrier’s complex transition from the G6 to THE Alliance. According to Mr Habben Jansen, THE Alliance has got off to a good start and has not suffered from the uncertainty surrounding Yang Ming, which is undergoing a period of financial restructuring. “We are not very concerned [about the financial status of Yang Ming] with everything that we know,” he said. He repeated there was a safeguard for shippers with the bankruptcy contingency plan incorporated into THE Alliance vessel-sharing agreement, but was confident “this would not be needed”. Mr Habben Jansen advised that new higher contract rates for Asia-Europe would not feature in the accounts until the second quarter, while for the transpacific trade the positive effect of new contract rates could be later still. He said the figures quoted by Maersk yesterday, of contract rate increases of $450 and $300 per 40ft for Asia-Europe and Asia-US respectively, were “not very far off” the increases obtained by Hapag-Lloyd. As to how quickly Hapag-Lloyd could pass on the increased fuel costs to shippers, Mr Habben Jansen said “in reality the delay was one to two quarters”. The merger would cement Hapag-Lloyd’s position as the fifth-biggest ocean carrier, with a combined capacity of 1.55m teu – just behind Cosco with 1.7m teu and comfortably ahead of Evergreen’s capacity of just over 1m teu. In the interim, he said, the UASC fleet of 60 containerships had been incorporated into THE Alliance network – as would the Gulf carrier’s two newbuild 15,000 teu vessels when they are delivered later this year. Hapag-Lloyd had said previously there would be one-off costs of some $150m associated with the merger, but it estimated that synergy cost savings of $435m a year could be achieved from 2019.